Increase your home's energy efficiency with our water resistant basement wall panels. When it comes to building considerations for basement projects, basement walls are the number one priority for many homeowners. The right basement wall panels will provide excellent insulation for increased energy efficiency and protect against moisture. 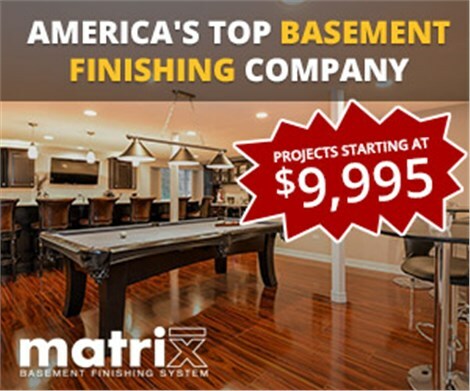 Since 2009, Matrix Basement Systems has completed more than 3,000 basements, giving us the experience you need in a remodeling company. Our basement remodeling services are comprehensive, cost-effective and consistent. Basement remodeling can get incredibly pricey, but because we do everything from design and interior decorating to wall installation and electrical fixtures, we offer competitive rates. Our cost to remodel basements is generally half of the industry average charge, meaning we are not only the highest quality remodelers, but the most cost-effective as well. We provide exclusive financing deals for our customers and stand by our work 100% - we offer a warranty on labor and a 50-year warranty on products so you can call us with confidence! Thinking about remodeling your basement? Contract Matrix Basement Systems today for more information on how we can create the basement of your dreams. Call us or use our convenient online quote form to get started!